By: Barbara Hutchinson, MD,cardiologist at Anne Arundel Medical Center. Dark chocolate has gained a reputation as being a heart-healthy treat because cocoa beans are rich in flavonoids—a nutrient that protects plants from toxins and helps repair damage. The term ‘antioxidant’ is a reference to those benefits. Studies have shown when we eat foods rich in flavonoids, we also benefit from these antioxidant powers. Flavanols are the main type of flavonoid found in cocoa. In addition to their antioxidant qualities, research has shown other potential health benefits, such as lowering blood pressure. But not all dark chocolate is created equal. The more processed chocolate is, the more flavanols are lost along the way. And flavanols are not a nutrient reported on food labels. For the most health benefits, choose a dark chocolate with a cocoa content of 70 percent or higher. And remember, chocolate is not a ‘health’ food. 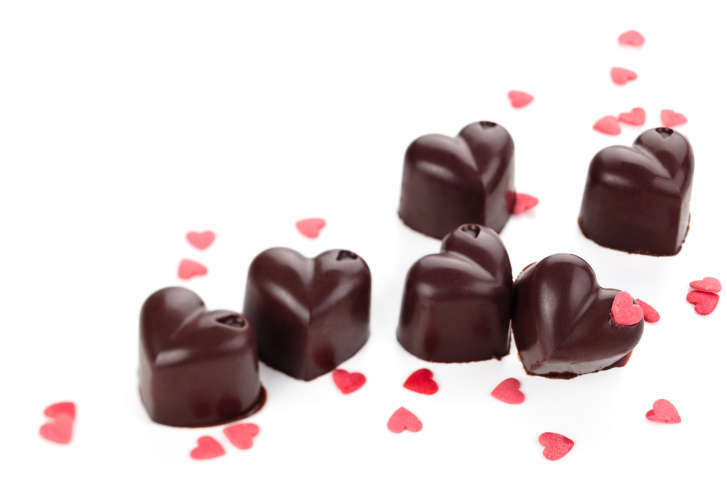 Enjoy dark chocolate as part of a well-balanced, heart-healthy diet. Think of it as a treat rather than a regular part of your diet. Red wine, in moderation, has long been thought of as heart healthy. Those who drink moderate amounts of red wine seem to have a lower risk of heart disease. An antioxidant called resveratrol is the substance in red wine that has received a lot of attention. The ingredient may help prevent damage to blood vessels, reduce low-density lipoprotein (LDL or ‘bad’ cholesterol’) and prevent blood clots. While those benefits might sound great if you enjoy a five-ounce glass of red wine with your evening meal, I would never encourage anyone to start drinking alcohol on the premise that it’s heart healthy. Too much alcohol has harmful effects on your health, such as raising your risk of high blood pressure, liver damage, obesity and certain types of cancer. Drinking too much regularly can actually weaken your heart muscle. If you truly want the health benefits of antioxidants, you should think outside of the wine and chocolate box. Stock your kitchen with antioxidant ‘super foods’ such as blueberries, strawberries, purple grapes, raw nuts, dark green veggies, salmon and green tea. Learn your heart age and risk for heart disease with AAMC’s free heart health profiler. Take it before March 30, 2017 for a chance to win a $250 Amazon gift card.